Michael suggests sowing new lettuce repeatedly as the season progresses so you can harvest continuously. Lettuce often leaves a lot of people scratching their heads, so if you've ever wished you knew how to grow it successfully at home, read on for some useful tips that will have you eating your own delicious lettuces almost year-round. Michael Weishan says there are two key tricks to growing lettuce  both simple common-sense techniques, but very important to remember. 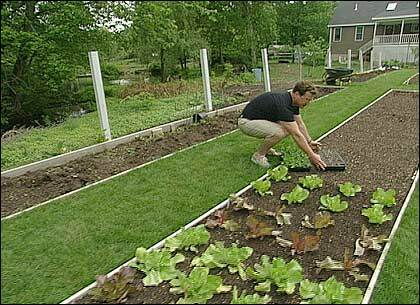 First, you want to sow new lettuce continuously every two weeks starting in the spring. This ensures you'll always have fresh ready-to-eat lettuce in your garden. At The Victory Garden we recommend sowing your seeds in flats indoors or in your greenhouse, which will allow the seeds to get started much more quickly than in the ground. The seedlings will be strong enough to go out into the garden after a few weeks. The second key to healthy lettuce all season long is making sure to change varieties as the year progresses. (See plant list below.) Early in the spring, choose hardy varieties with good cold-tolerance. As the weather begins to heat up, move to mid-season lettuces. Then, during the height of summer, you want to start sowing late-season varieties with a strong heat-tolerance. First, sow your seeds in flats. The seedlings will be ready to move outside in a few weeks. Even when summer winds down and the weather turns cool again, the season for fresh greens doesn't have to end. With the help of a cold frame, you can continue harvesting hardy winter varieties of lettuce for two to three months longer. 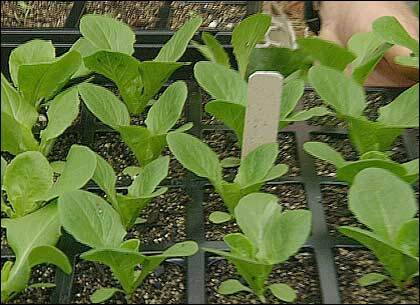 Planting different varieties will ensure healthy lettuce throughout the season. We've talked previously about the use of cold frames as tools transitioning young plants from indoors to the garden, to get head start on the planting season, but they're also useful at the end of the season to protect your plants from the oncoming frost. Cold frames create microclimates that can be adjusted based on outside conditions: close the frame completely on cold or frosty nights, leave it slightly vented during warmer days, or open the flap all the way when it is very sunny. With a greenhouse or permanent cold frame, you can continue growing fresh lettuce as long as there is adequate natural sunlight. A portable cold frame can also buy you extra time in your plant beds themselves  at least until the ground freezes hard. Just remember that whatever the conditions, it's always essential to monitor your cold frame closely to maintain optimum conditions for the plants. 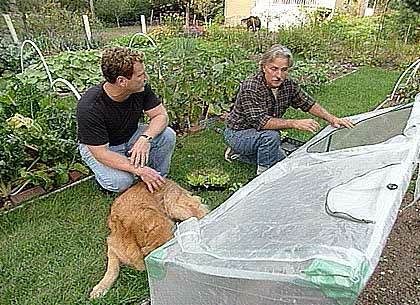 With a portable, insulating cold frame you can go on harvesting winter lettuce till the ground freezes. With lettuce, Kip Anderson emphasizes that the goal for your fall crop is to maintain a bed of fresh cutting greens  rather than whole heads  which means you don't need to use plants that were started indoors. Rather, you can directly sow hardy winter lettuce or spinach into a fertilized garden bed under the cold frame, and begin harvesting a fresh winter salad in less than six weeks. With this method you can enjoy fresh lettuce from your own garden from early spring all the way through late fall. We've chosen the following lettuce varieties for planting at the Victory Garden throughout the season. Note: Lettuce varieties are grouped into four general categories depending on their leaf-type and growing properties: loose leaf, romaine (or cos), butterhead (or bibb), and crisphead. This segment appears in show #2708 and #2826.